Going into the 2015 BC I was not prepared to run. As I mentioned in an earlier post I am suffering from an insertional Achilles tendinopathy injury. Work and life in general has been a bear since I ran my last ultra in December. I organized my kit for the BC two weekends prior to the event as I would have no time or mental capacity to do so at the last minute. Given the Achilles niggle I have and my inability to relax and focus on the BC I seriously considered not starting. If you’ve read any of my previous BC reports that would come as a surprise as the BC is on my list of “Must Do” events each year. I made my final decision to run Friday morning committing to myself as I got in the car that I would unwind from the rest of my life as soon as we started running Saturday morning. In 2015 I arrived in Göttingen much earlier than in previous years to meet with Aschu who was kind enough to put me up for a night or two. This early arrival enabled the opportunity to also arrive at the Check-in/Briefing site way ahead of schedule. After feebly “helping” out a bit I adjourned to a seating area in the foyer of the hall where we were located. This area in which ultimately found a rather large group of us sitting became referred to as the “BC Lounge”. We were all sitting facing the stairwell where everyone had to enter to get checked in and it became a place to reunite, chill, talk about things runners talk about (shoes, equipment, physical well being, race plans, etc.) and share many laughs. Following the race briefing which introduced the event, the organization, beneficiaries, and a Carnival like run down of the race itself, Aschu and I headed back to his place. Thankfully, Friday evening included a simple, but delicious (seriously) dinner and much delightful discussion with Aschu. We collectively went through our gear one last time and braced for a restless pre-race evening. Saturday morning I was relieved that I had gotten a good night’s sleep on Thursday night as I was hyped up and did not sleep well Friday. We had set alarms for 0400, but I think that both of us were awake and ready to go well before the alarm rang. After a few cups of Yogi tea and a banana to knock the remnants of the night we set out for the BC start. We arrived at the old Dance Hall at Kehr and the start location as breakfast was cranking up and runners were signing in. Over the past seven years I’ve admired the volunteers and runners that brave the cold of this old Dance Hall (It’s really more like a barn. ), particularly the volunteers led by Juliette Mallison. 2015’s breakfast layout was exceptional. We were even treated to portable heaters which drew crowds of runners to them much like bar patrons to bistro tables with dishes of peanuts. The breakfast buffet was second to none with my favorite including the fresh fruit salad and cereal. Breakfast was another opportunity to connect with friends and acquaintances. It was great to see Michael, Sabine, Uli, Werner and many others. Werner, you’re insane running the BC on Valentines Day and your anniversary to boot! Gutsy my friend. Very gutsy! Before I knew it, it was time to head outside to assemble to get ready for the 0600 start. The section from Wasserheide along the Steinaer Bach leading up to the wonderful aid station at Jagkopf. But these periods were off set by the incredible weather and the opportunity to spend some time alone and with friends like Rolli. - Never attempt an ultra as a whole. Instead, you must view it in its parts or elements, thinking only as far ahead as the next aid station. Doing so allows you to manage the whole without being overcome by the WHOLE. - To manage an ultra in its parts is to remain in the present. This presence of mind allows me to slip out of the monotony of life and into the bliss that Terray so aptly described from his experiences in the mountains. - Negativity breeds negativity in both the psychological and physical sense. For me, even the smallest, most quaint negative thought streams impact my well being. I actually work to cast negative thoughts from my mind like little clouds. I attempt to accept them for what they are and move on. Only so am I able to remain focused on my goal and the presence of the moment. - I have found that my mental and physical state are driven by the energy in my tank. During an ultra I require a steady intake of both fluids and fuel. Although the BC offers a delightful variety of organic, vegan fare, I found that I could not get what was offered in 2015 to either fuel me, much less stay down. I literally blew up at the half way point. I felt like a new man after emptying my gut. From Barbis forward I stuck with my own gels and energy bars and drank the bouillon soup and ate apples over the course of the rest of the race. My final push from Oderbrueck (72.4KM) to the Brocken summit was dedicated to James Sedberry. James was a lifelong friend that lived through an eternity of life with multiple sclerosis. He passed away on 7 January 2015. James’ childhood nickname was “Happy” as he was never without a smile. Happy was in his element outside. I think he would have enjoyed the Harz much like I do if not more. The memory of his smile carried me the last 7.5 kilometers to the finish line. Registration for the 2015 BC opened in early November 2014 via a lottery. Application to the lottery was submitted via the BC web site. Results of this lottery were published on the first of December 2014. Weather conditions leading up to the 2015 were promising with a good bit of snow in late December into January. Low temperatures were consistent almost up to the week prior to the BC. A warming trend occurred this last week before the event causing significant snow melt below 300 meters. The snow and ice line retreated primarily into the Harz National Park after the mid-point aid station. On race day temperatures hovered just at freezing with slightly colder temperatures beyond Jagkopf. Blue skies and sunshine were to rule the day on the 14th. 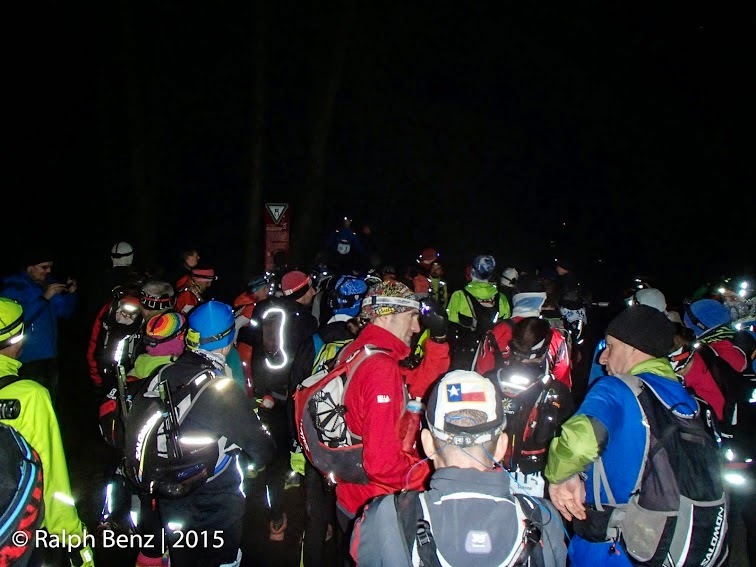 On 14 February 2015 170 BC starters lined up at Hainholzhof (Kehr) in Göttingen to give the course a go; 160 runners finished! Antje Mueller of Rötha won the women’s category with a blistering 8:52 finish. Florian Reichert of Göttingen set a new men’s course record in 6:33! I had a sensational day besting my 2013 time by 32 minutes in 11:21. The Brocken-Challenge is a winter charity ultramarathon of approximately 80 – 85KM with a positive change of 1900 meters in altitude that takes place over a mixed surface course between the city of Göttingen and the finish on the Brocken Summit (1142m) in the Harz. All donations for the BC benefit a number of local, regional and international organizations details of which can be found here. The BC route travels over farm roads, forest, hiking and cross-country ski trails. The route varies each year based on the amount of snow in the Harz National Park. The course originates in Göttingen and passes checkpoints/aid stations at Landolfshausen (10.9KM), Rollshausen (21.8KM), Rhumequelle (30.7KM) and Barbis (Dreymanns Muehle) (42.5KM) over what is a large bowl like terrain feature. 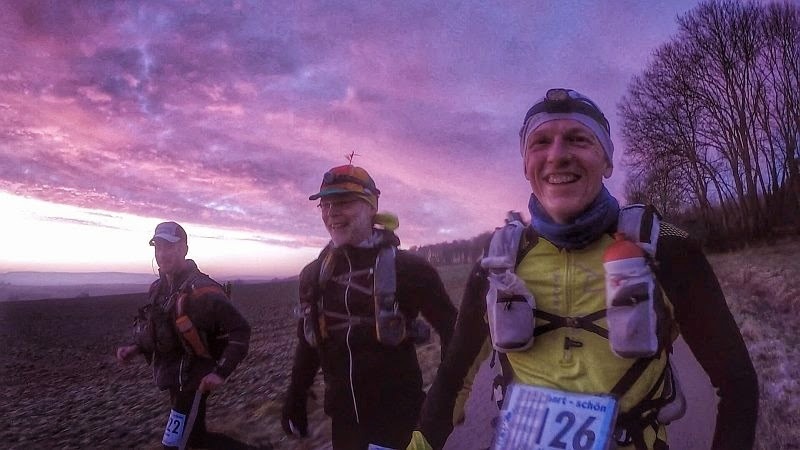 The ULTRA in the BC begins at Barbis where the course enters the Harz National Park passing through aid stations at Jagkopf (53.8KM), Lausebuche (63.1KM), Koenigskrug (68.5KM), Oderbrueck (72.4KM) before proceeding to the finish line on the summit of the Brocken. The leg between Barbis – Jagkopf – Lausebuche is best characterized as the Gut Check of the entire course as the Jagkopf is only accessable by foot with no opportunity to drop at this aid station if you were to become so inclined. BC organization, volunteer support and aid stations are simply among the best I’ve experienced particularly when you consider that all of this is accomplished via volunteers and donations. Aid stations are second to none and have been characterized as the Longest Organic Food Convention in the World. The 2016 Brocken Challenge date is set for 13 FEB 2016. My calendar is marked and I’m watching for when applications for the 2015 lottery will be taken. Count me in!